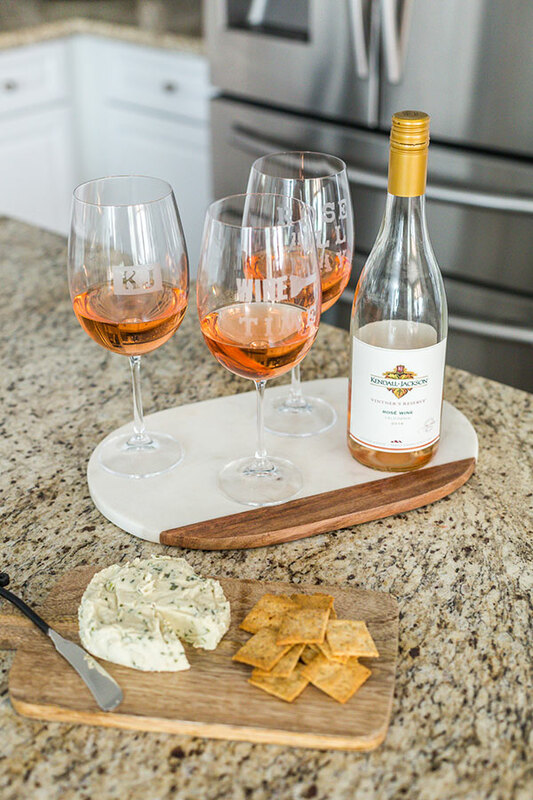 Create a one-of-a-kind wine experience with this simple DIY personalized wine glasses project. There are few things I enjoy more in life than spending a beautiful day with family or friends, nibbling on good food and sipping on better wine. Any chance I get to elevate the experience I jump at it and this DIY wine glass etching project does just that. 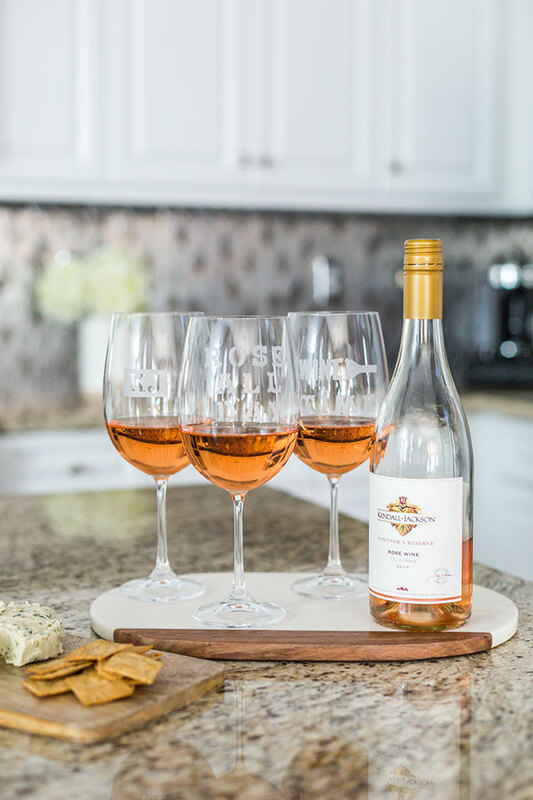 Who wouldn’t love to hold personalized wine glasses with some of your favorite sayings while kicking back with loved ones? Even better when the project is easy to do and doesn’t cost a lot to make! The biggest decision you’ll have to make here is what to stencil onto your wine glasses. 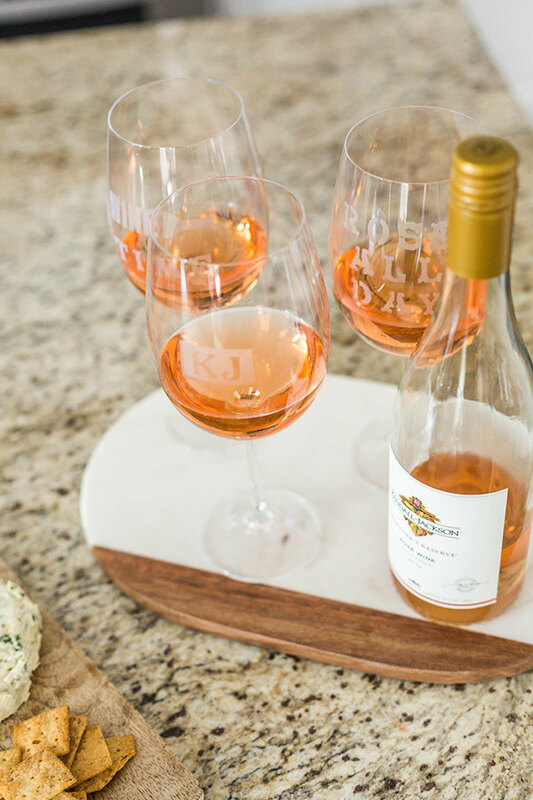 We decided to go with “WINE TIME,” “ROSÉ ALL DAY,” and “KJ” since we love Kendall-Jackson’s Vintner’s Reserve Rosé. Tip 1: Apply an even layer of etching cream in one direction across the project to ensure even results. Tip 2: Since these are permanent designs, there should be no issues with the glasses ability to go in the dishwasher. Tip 3: The etching cream will still keep the glasses food-safe yet susceptible to staining. Keep the etched designed to the outside of the glass to prevent stains. Tip 4: Test your glass first as not at glassware is created equal. In a non-visible spot, dab the end of a toothpick in etching cream and let sit 10 minutes & rinse to ensure it worked. Tip 5: If using letters, purchase multiple packs of self-adhesive stencils for duplicate letters. Tip 6: Do not rinse etching cream in a porcelain or enamel sink as the etching cream could cause damage! Use a stainless steel sink or utility bucket to avoid damage. Wash the wine glasses with dish soap and warm water. Dry thoroughly with a lint-free cloth. Cover a work surface in a well-ventilated area with a plastic painting tarp. Apply adhesive stencil to the wine glass. Remove any air bubbles with your fingers and tape off glass around the stencil to prevent any drips onto the glass. While wearing rubber gloves and using a small straightedge paintbrush, apply a thick layer of etching cream (you shouldn't be able to see the glass in the area you are applying the cream). Wait 10 minutes. Rinse glass in warm water (from top down) to remove all etching cream, and then remove stencil and tape. Let the wine glass air dry or use lint-free cloth to pat dry. Wash stencil with warm water to remove any etching cream residue. Do not remove gloves until stencil is clean. Let dry before reusing. 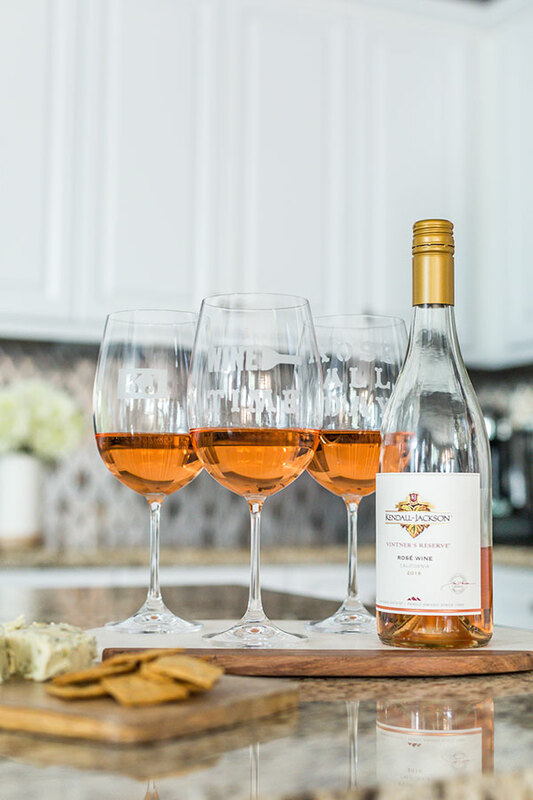 Pour a glass of Vintner's Reserve Rosé and enjoy! Does anyone else feel like they instantly get transported to summer when they sip on rosé? We’re pretty lucky out here on the West Coast to experience pretty mild winters, but none-the-less I’m always eager for sunny afternoons spent with great friends. 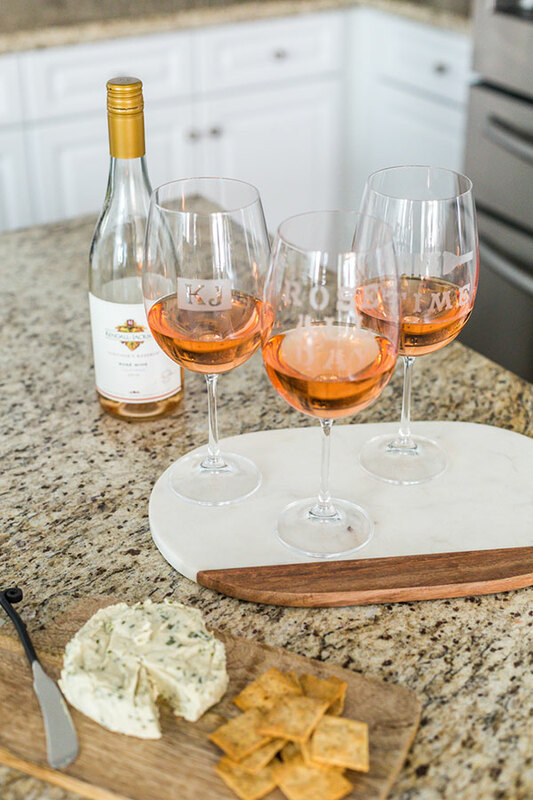 In our house, we’re always ready for wine time and rosé all day. Cheers! Love this DIY project? Share it with your friends or PIN it to save for later!